1867 წლის ავსტრია-უნგრეთის კომპრომისი (გერმ. Ausgleich, უნგრ. Kiegyezés) — შეთანხმება, რომლის შედეგადაც ავსტრია-უნგრეთის იმპერიაში დაწესდა ორმაგი მონარქია. კომპრომისმა აღიარა უნგრეთის სამეფოს ნაწილობრივი სუვერენიტეტი, რომელიც აღარ წარმოადგენდა ავსტრიის იმპერიის ნაწილს. მოხდა ჰაბსბურგების მიწების რეორგანიზაცია და ავსტრია–უნგრეთს შორის ურთიერთობა გარდაიქმნა რეალურ კავშირად. ავსტრიულ ცისლეიტანიის და უნგრულ ტრანსლეიტანიის მიწებს ჰყავდათ ცალ ცალკე პარლამენტი და პრემიერ მინისტრი. კავშირს ჰყავდა ერთი მეთაური, რომელიც ორ ტიტულს ატარებდა ავსტრიის იმპერატორის და უნგრეთის მეფის. Cornwall, Mark (2002), Last Years Of Austria-Hungary: A Multi-National Experiment in Early Twentieth-Century Europe (2nd რედ. ), University of Exeter Press. Seton-Watson, R. W. (1939), "The Austro-Hungarian Ausgleich of 1867", The Slavonic and East European Review (19.53/54): 123–40. Seton-Watson, R. W. (1925), "Transylvania since 1867", The Slavonic Review (4.10): 101–23. Taylor, A. J. P. (1952), The Habsburg Monarchy, 1815 – 1918: A history of the Austrian Empire and Austria-Hungary., New York: Macmillan. Tihany, Leslie C (1969), "The Austro-Hungarian Compromise, 1867–1918: A Half Century of Diagnosis; Fifty Years of Post-Mortem", Central European History (2.2): 114–38. 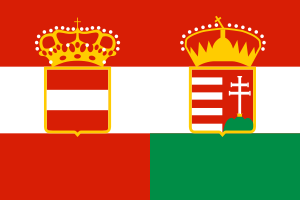 Sowards, Steven W (23 April 2004), Nationalism in Hungary, 1848–1867. Twenty Five Lectures on Modern Balkan History, Michigan State University, http://staff.lib.msu.edu/sowards/balkan/lect07.htm. წაკითხვის თარიღი: 19 March 2009.
ეს გვერდი ბოლოს დარედაქტირდა: 17:25, 17 სექტემბერი 2017.